But, Narayana Peesapaty the founder and directing manager of Bakey's, an Indian cutlery company, has a possible solution—spoons and forks you can eat. His edible cutlery is made from millet, rice and wheat flours and was the first of its kind when it was developed in 2010. Today, Peesapaty is one of several players in the edible cutlery game, a burgeoning niche that's created buzz among consumers but received lukewarm reception from environmentalists. Peesapaty said he was inspired to create the product while watching his country's plastic problem mount and the use of plastic utensils become more routine. It's estimated that India discards about 120 billion pieces of disposable plastic utensils each year. With a background in groundwater research, Peesapaty said he also wanted to use a raw material that wouldn't put much pressure on India's already depleted water resources. That's why the utensils are made mostly with millet. The ancient African grain absorbs liquids at a slower rate and is suitable for cultivation in semi-arid areas. The vegan edibles come in three different flavours — plain, sweet, and spicy — and have a shelf life of about three years. If users don't feel compelled to eat their cutlery at the end of their meal, the spoons and forks will naturally decompose within four to five days — if they're not eaten by an animal first. But the edible cutlery cannot be reused. The utensils went viral after a video was posted to Facebook in 2016. The company said it has since expanded globally, with consumers around the world buying the edible cutlery from the company's online store. But Bakey's stumbled that same year when it held two online crowdfunding campaigns on Kickstarter and Ketto and collected more than $300,000. Donors were promised packs of edible spoons for their contributions, but some are still commenting on the fundraising pages that they have yet to receive them. A dispute ensued with the U.S. distributor, Sarah Munir, who Peesapaty says advertised the spoons at an unreasonably discounted price and shipping rates, and sent him only $148,000 of the $280,000 raised on Kickstarter. CBC News was unable to reach Munir, but she wrote on the Kickstarter campaign page that the delay was caused by production problems on Bakey's end. Peesapaty admits his machines did break down during the fundraiser when he was still refining his process, but says that he's working to catch up on orders from the Kickstarter supporters. But the millet spoons aren't the only edible cutlery option. American companies like Bocado Handcrafted Products are also making edible, biodegradable spoons. Others like the Edible Spoon Maker (EDM) and Wilton, sell irons and moulds that allow consumers to create their own spoons at home. But some environmentalists think the edible options don't go far enough to address the plastic waste crisis. More than 8.3 billion tonnes of plastic has been produced since the 1950s, 60 per cent of which has ended up either in a landfill or the natural environment. 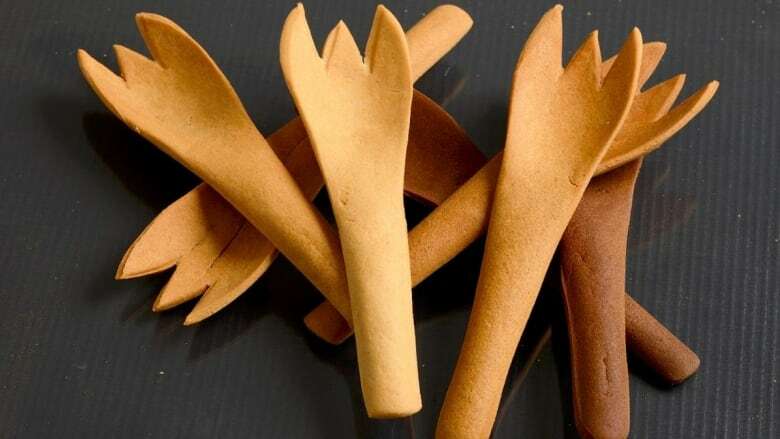 "I think the edible cutlery is a fun idea; it really shows that there are innovative and creative solutions to single-use plastic, said Emily Alfred, the waste campaigner at the Toronto Environmental Alliance. "But I don't think it is enough." Alfred said replacing single-use plastic with another single-use product isn't going to solve the problem because — while better than plastic — edible options also use up a lot of resources and energy. "We are still dedicating a lot of our resources to these new products, whether it is to create them, transport them, have them packaged or processed." Those resources could be used in other ways to reduce plastic waste, said Alfred. And since the Bakey's cutlery is only made in India, it must be shipped or flown to other countries, where plastic cutlery could be made or sourced locally. The company sold 2.5 million spoons last year to catering companies in India and has several hundred international customers. Alfred said the best way to tackle the plastic waste crisis is to continue following the "three Rs." Loujain Kurdi, a Greenpeace spokesperson, says she agrees with Alfred. She suggests consumers buy lightweight metal cutlery sets designed for use on the go instead of plastic or edible utensils. "When we use reusables, we're reducing and reusing at the same time."